I spent my 2018 summer months writing a short (around 30,000 words) booklet which is designed to be a pragmatic guide for lawyers on social media in business development and client relationship management. It addresses both firm-wide and individual lawyer approaches. 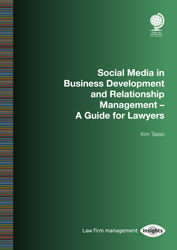 Publication of Social Media in Business Development: A Guide for Lawyers is expected in November 2018. The booklet provides a practical introduction to social media for lawyers. It starts with a review of the benefits and risks of social media use by lawyers so that those in management positions with little knowledge of social media can make informed policy decisions. By avoiding technical details and jargon, it then offers an introductory and pragmatic guide on how all lawyers – irrespective of industry sector, firm size or client base – can successfully integrate social media into their marketing, business development and client relationship management programmes. Containing essential information on the benefits and risks of social media in the legal sector, it examines the social media platforms used by many law firms (LinkedIn, Twitter, Facebook and YouTube) and gives an overview of those less frequently used – enabling lawyers to make an informed choice. It provides step-by-step instructions for setting up profiles and pages and using them on an ongoing basis. how to integrate social media into a structured content management plan that supports business development objectives. It also addresses how central systems, technology and support can be used to ensure that social media plays an effective part of a firm’s business development programmes. So, in addition to lawyers, it will useful to marketing and human resource professionals in law firms who want to ensure the effective and sustainable use of social media.